September brought us a first look inside the set of Darren Aronofsky's Biblical epic Noah starring Russell Crowe, and we caught some small glimpses of the ark as a work in progress. Now a new photo shows just how massive this ark turned out to be. It was built to the proportions described in the Bible, but the complete ark will be created by using CGI set extentions. 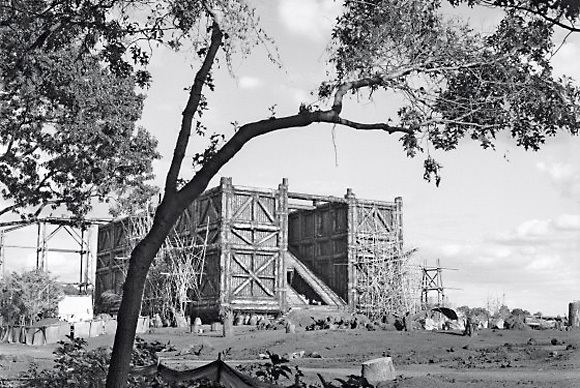 However, the set decorator brought in tree trunks to place around the massive ship to indicate it was built from some trees nearby. Photographer Dan Wagner says, "To see it in person, and know there’s no CGI involved, was incredible. And there’s no way Noah and his sons could have built such an enormous structure themselves. That would have taken 500 years.” Look! To see more of Dan Wagner's photography, go to his official website right here. The photographer says, "To see it in person, and know there’s no CGI involved, was incredible. And there’s no way Noah and his sons could have built such an enormous structure themselves. That would have taken 500 years.” Unfortunately I live in Texas where there is a large majority of the population that truly believes that Noah and his family built said boat and put two of every animal on it. Now that would be one big damn boat. Large majority of the Texans are morons to believe this actually happened! Didn't I read somewhere that the Ark was only half the size of the Titanic? And there are people who think you can fit 2 of ever animal species on the planet on board. ha. Looks more like a Houston condo complex. Of course, two of every kind of animal still applies. Is that the dry dock (or whatever it's called) or is that the actual boat? because that looks like no boat I've ever seen. Is that the point? What's with these movies with just names for titles? Are we that dumbed down?